Concord Daily Tribune (Concord, NC), 25 Jan 1926. Click on image to enlarge. Rights reserved by the source institution. Took Her Own Life at Early Hour This Morning Following an Illness of Several Months. Miss Constance Cline, member of one of the most prominent families in Concord and for a number of years a teacher and supervisor in the Concord public schools, took her own life this morning shortly before 7 o’clock at the home of her parents, Mr. and Mrs. John A. Cline, on East Corbin street. Ill health is assigned as the cause of her act. Miss Cline was missed about 7 o’clock this morning when members of her family went to her room to call her. Neighbors were notified and a search was instituted, the hanging body being found in an old wood shed near the home. Neighbors went to the wood shed when they detected tracks in the snow leading from the house to the shed. Miss Cline was 47 years of age, and had spent the last 44 years in Concord, her family having moved to this city from the old Cline home on the Mt. Pleasant road when she was three years of age. She attended the public schools in the city, graduated from Mont Amoena Seminary and took post-graduate work at the Massachusetts Normal and at Columbia University. After leaving the normal she was for six years principal of the preparatory department of Queens College, in Charlotte, leaving that work to accept a position with the public schools of this city. She continued her work here so successfully that she was made the first supervisor of the grammar schools and was in charge of that work when her first serious illness developed several [sic] ago. During the past nine months she had undergone treatment in several hospitals both in the East and South and while her physical condition had shown improvement she had not been able to throw off the spirit of melancholia that developed from her intense suffering. In church work Miss Cline was always active, giving much of her time and talent to the work of the women’s organizations of St. James Lutheran Church, with which she was affiliated in girlhood. She was at one time an officer in the State Lutheran women’s organization. The deceased is survived by her parents, two sisters, Mrs. Roy T. Troutman, of Charlotte, and Miss Olivet Cline, of Concord, and four brothers, Ralph E. Cline, of Gaffney, S. C.; Karl B. and Frank s. Cline, of Salisbury, and A. Campbell Cline, of Concord. 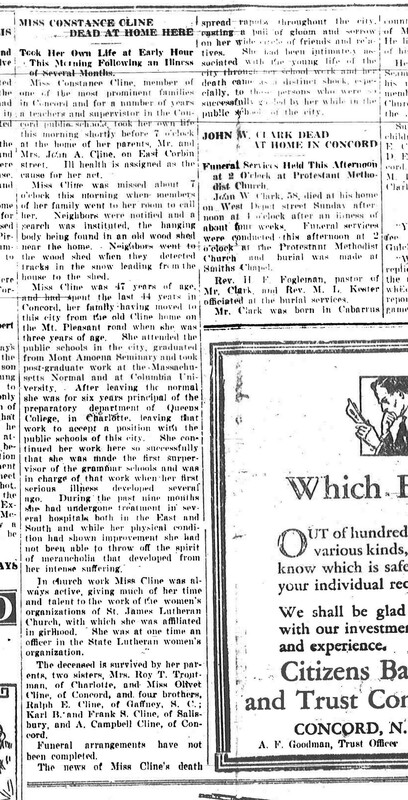 The news of Miss Cline’s death spread rapidly throughout the city casting a pall of gloom and sorrow on her wide circle of friends and relatives. She had been intimately associated with the young life of the city through her school work and her death came as a distinct shock, especially to those persons who were so successfully guided by her while in the public schools of the city. This entry was posted in 1920s, Newspaper Article, Students and tagged 1920s, Newspaper Article, Students. Bookmark the permalink.